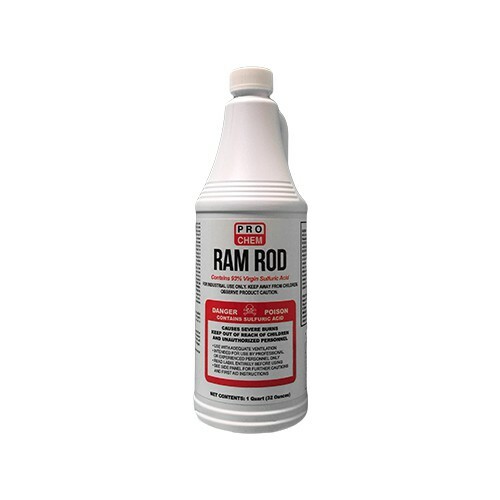 Ram Rod | Pro Chem, Inc.
RAM ROD is a heavy-duty, ready-to-use liquid drain cleaner for clearing drains clogged by organic matter. It quickly dissolves obstructions such as grease, hair, sanitary napkins, rags, sludge, soap, paper, food, cotton, tea, coffee grounds and cigarette butts in drains, sinks, toilets and grease traps. Special inhibitors prevent the production of harmful odors, which could cause coughing and choking. The inhibitors also prevent damage to all metals except aluminum. For completely clogged drains: Remove standing water before pouring. Pour 4 ounces drain cleaner into drain. Using more than 4 ounces could generate excessive heat, causing toilet bowls to crack. Allow to stand 15 minutes. Carefully and slowly add 4 ounces water. Wait 5 minutes, then slowly run cold water. If drain is still clogged, repeat process. For partially clogged (slow) drains: Pour 4 ounces drain cleaner and let stand 5 minutes. Repeat this procedure. Flush several times. Warning: This product is for use in sinks, drains, toilet and grease traps only. Never use in septic tanks and/or cesspools. Do not allow product to stand on porcelain or enamel fixtures, as it may cause etching. Never use a plunger with this product. Do not get on aluminum or floors. Never use in garbage disposals, dishwashers or pipes directly connected to such devices or in drains equipped with check valves or antibackflow.